I was wondering what other people do when the wool fiber they have purchased has become compressed during shipping or storage. I usually divide into portions from the compressed state and “pre-draft” them. I am not entirely sure what other people mean by pre-drafting either. Let us start with an example. I received a 4m length of fiber as a club shipment (it is the March Spunky Club, called something like ‘mud bath’ or ‘muddy waters’ or something (but I have lost the tag and I do not care) and yes I know the caption is wrong) assuming I am going to try to keep the plying matched by color, I would divide vertically into two strips. 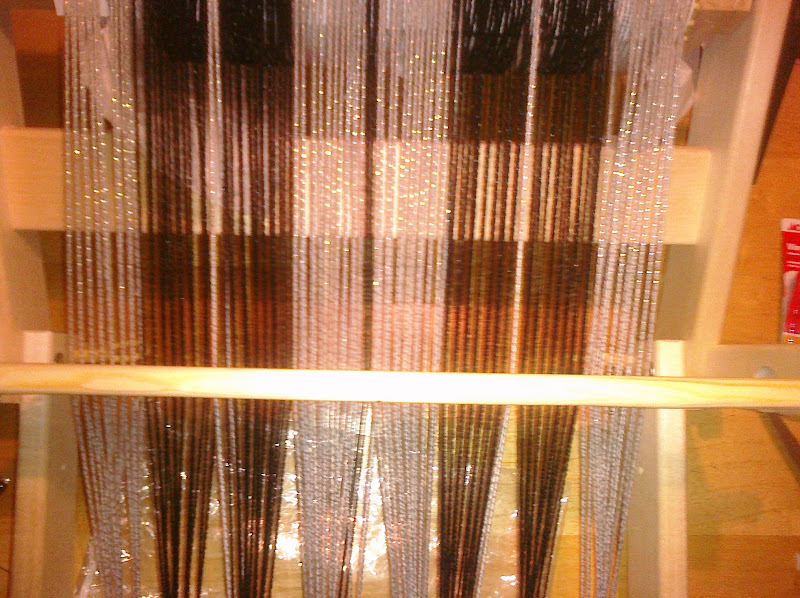 Each of these strips would be spread sideways into a 4m 6-8 inch wide ribbon. Then the ribbon would be pulled along its length adding a half-inch to every inch or so. This nets a 6-8m long, mostly round, snake of fiber which is almost all air. That is a long length to deal with effectively, but I have trouble keeping the ends in the correct order if there get to be too many pieces. With the CMF thumb-width roving, I pulled it into quarters horizontally (the way you would normally cut something in half that is long and skinny). I attempted to spin directly from the roving but was having multiple breaks in the single. I then pre-drafted the rest in batches, though since I was not attempting to keep the color banding synched I could work with shorter lengths. I have been thinking that it would be nice if there were tools for the pre-drafting.